If you love the flavours of a traditional carrot cake, this moorish crunchy carrot cake granola will be just your cup of tea. It’s an ingenious way of sneaking vegetables in your breakfast too… Vegan, free from gluten and refined sugar. This carrot cake granola should come with a warning. IT’S TOO ADDICTIVE! I’ll be honest, a jar of granola never keeps in our house for very long. 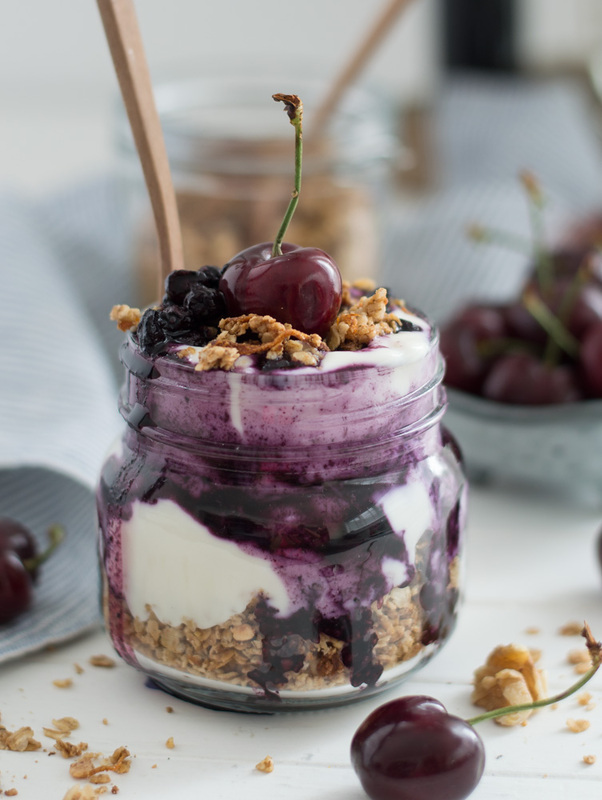 We [mainly I] eat a lot of it as it’s so versatile – whether you like it plain with a dash of milk, sprinkled on your favourite yoghurt or layered in a breakfast parfait (like I did below)… The combinations are endless. 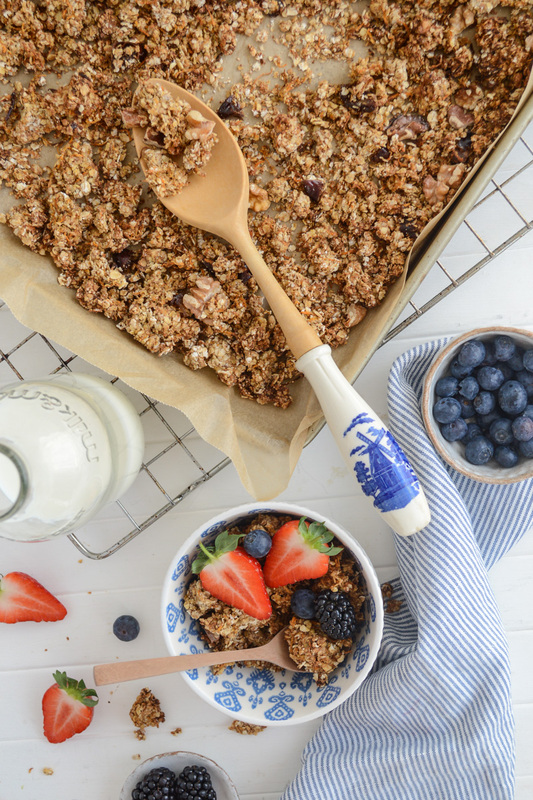 When it comes to the granola ingredients, I love experimenting a lot. 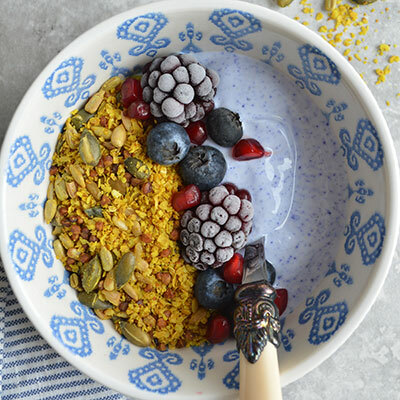 For an extra nutritional punch, I like adding buckwheat groats (like I did with this turmeric granola recipe), puffed quinoa and amaranth to my granola. To add a crunch, use your favourite nuts and seeds. To sweeten it up, medjool dates or raisins work very well. For a liquid sweetener I prefer using agave nectar or maple syrup but you can also substitute it with honey or date syrup. 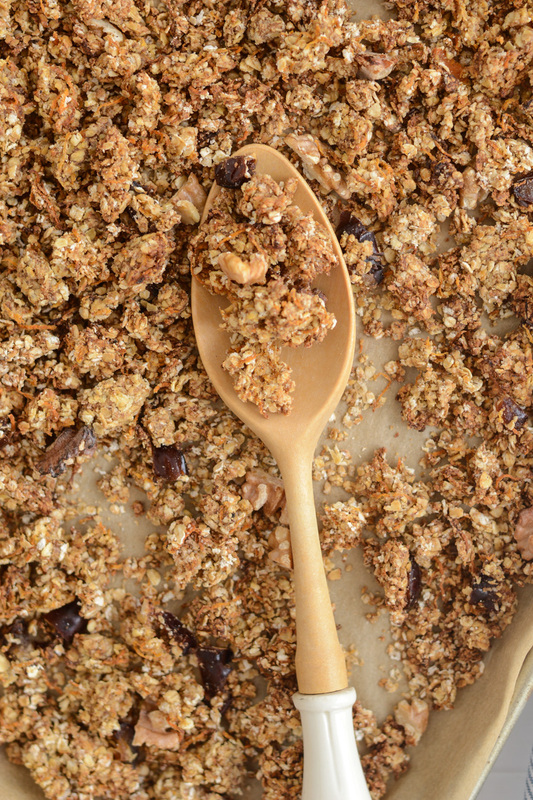 It’s so easy to tweak the granola ingredients to suit your taste buds. 1. Preheat the oven to 190C fan and line an oven tray with parchment paper. 2. In a big mixing bowl mix oats, carrots and spices (nutmeg, cloves, cinnamon & ginger). Set aside. 3. Combine maple syrup, almond butter, coconut oil and vanilla in a small saucepan. Bring to a gentle simmer and whisk until smooth. Take off the heat as soon as mixture starts to bubble. 4. Add the wet mixture into the bowl with oats and mix well to ensure the oats are well coated. 5. Transfer the oat mixture to the baking tray lined with parchment paper. If you like little clusters in your granola, scoop a handful of granola and squeeze tightly with your hands, so it forms little clusters. Bake in the oven for 10 minutes. 6. 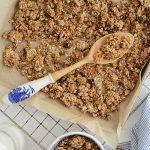 Take the tray out of the oven, mix in chopped walnuts and dates and bake for a further 10-13 minutes until the granola has turned golden brown. Keep checking on it to ensure it doesn’t burn. 7. Let it cool down for at least 10-15 minutes before you do ‘the obligatory taste testing’. It tastes so good on its own! Enjoy plain with some milk, sprinkled over your favourite yoghurt or add it to a smoothie for extra texture. 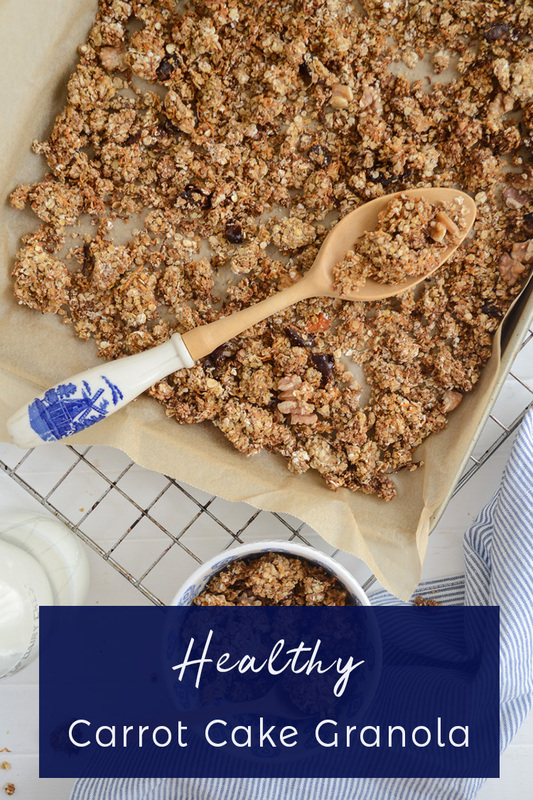 I really love granola, but for some reason have not been eating a lot of it lately…Perhaps I was waiting for the right recipe to come my way…and here it is!!! Looks so crunchy, and carrot cake flavour sounds so yum! Gorgeous as always! This looks crunchy and delicious. I love the idea of carrot-cake flavor with granola. I’m sure two will be so delicious together. You know I have never made granola I guess now is teh time to make it following your yummy recipe. The flavors are perfect for my family’s tastebuds. I cannot get over how brilliant this recipe is! I’m so excited to make a big batch this week! My husband loves this granola! He is a HUGE fan of carrot cake flavors! I need to pin this! 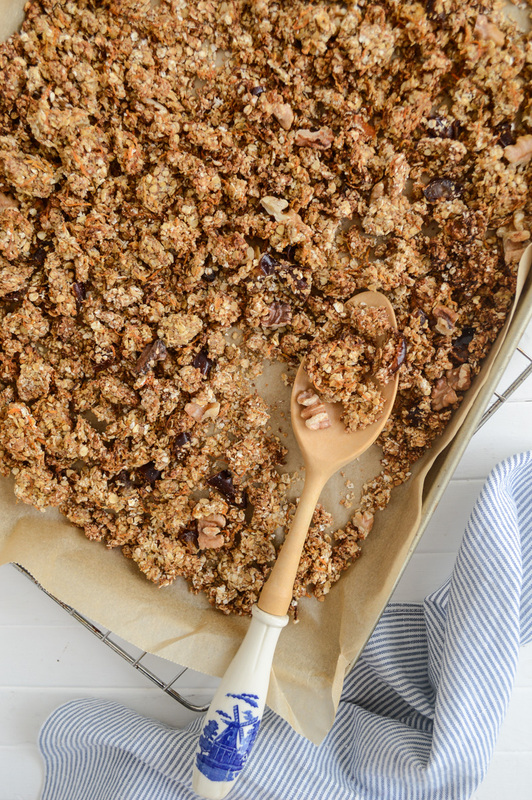 The most delicious granola ever! What a fabulous idea!